After finishing college in May as an English and Education double major, I was soooo over reading. My love for finding a good book and indulging myself in it every night until I fell asleep was turned into a chore to read classic novels in the context of whatever my professors told me to do. Don't get me wrong, I learned a lot about analyzing texts in ways that I had never done before, but I never had the time to pick up a book of my choice to get lost in. Now that I'm finished with school and working the hours of 8-3, I have all the time in the world to get myself back in the swing of things. My dad recently read a book called Gone Girl by Gillian Flynn. He raved about this story and so I decided to give it a shot. I was not disappointed. 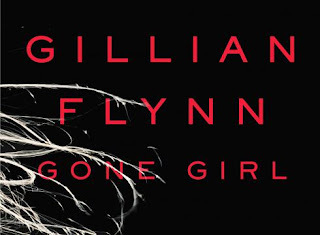 I started Gone Girl with very high expectations (never go into a book with high expectations!! ), because I was excited to read a book that wasn't written in the stone age with a story that I was told would keep me wrapped up for days. The very beginning of the book was interesting--a slow back and forth between two different points of view, one in the past through diary entries, and one in the present. This was the point when I questioned my dad's five star review of this book. The girl is gone and the guy is nervous...so what? I'm not going to give too much away, but as the book went on, I literally could not put it down. The points of view change quite a bit, giving you a deeper insight to a rocky relationship scarred by psychological instabilities. I read this book in three days, and I would have finished it sooner if my body wasn't telling me to eat and sleep throughout the day! I recommend this book to anyone who is interested in a suspenseful story with tons of "WHAT??" moments! Please let me know if you read it what your thoughts are on it! Enjoy! Hey, I completely agree with you. An awesome book. Didn't like the ending though. I wish Amy had died or something.